Adjusting the white balance in your photos can be an easy way to make them look brighter and clearer. And that is because the light in some photographs taken with a regular camera can more than often look gray or yellow, rather than white. Even if with your naked eye you saw the image as purely white, your camera might view it differently. So balancing the white color in your digital images will make them seem livelier and sunnier. Open one or more images that need correction of white balance. You can add them one by one from a folder on your computer or drag-and-drop them directly in the reaConverter window. Go to the Edit images tab and then click Add action → Color adjustments → White balance. This will automatically edit all your desired images so that they gain a brighter and "cleaner" look. You can also choose color for manual white balance. 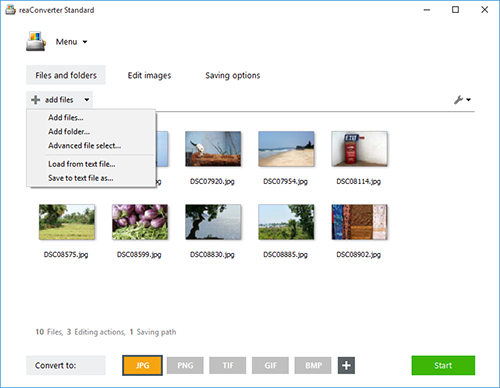 In the Saving options section, you can opt for storing your corrected images in a local folder or online, directly in your Google drive or Box.net account. After you have checked this option, decide if you want to preserve the initial format of your images or convert them to another one. 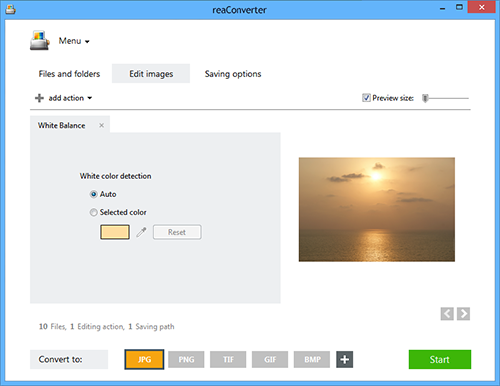 reaConverter supports over 40 image extensions, including both popular and less known or rare formats. Finally, click the Start button and your images will soon be available. Command-line white balance tool is an advanced feature meant for professional use, and is available in Pro edition only.